Year two in Monster Energy Supercross was a big improvement for Austin Forkner, as the 2018 season saw the Richards, Missouri, native right in the thick of the 250SX East Region Championship hunt. However, a title was not to be, as a crash while leading the race in Minneapolis led to an injured shoulder, and Zach Osborne was able to take the race win and ultimately defend his #1E plate. Still, ’18 was a solid stadium season for Forkner, with the 20-year-old scoring back-to-back wins at Tampa and Atlanta. 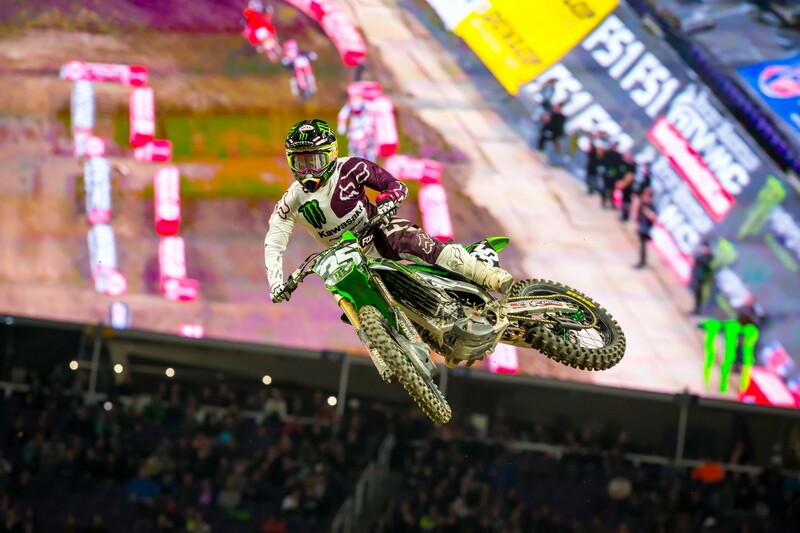 So what will 2019 bring for Austin Forkner? We’ll find out, but we don’t know when—could be January 5, 2019 at the 45,477-seat Angel Stadium in California or February 19, 2019 at the 66,860-seat U.S. Bank Stadium in Minnesota. On either coast, Austin Forkner is a threat to win races and a 250SX title. One week out for the start of the new racing season, Racer X caught up with the hard charging Midwesterner. Racer X: Austin, I’m going to take a wild shot at it and ask, do you know if you are East or West yet? 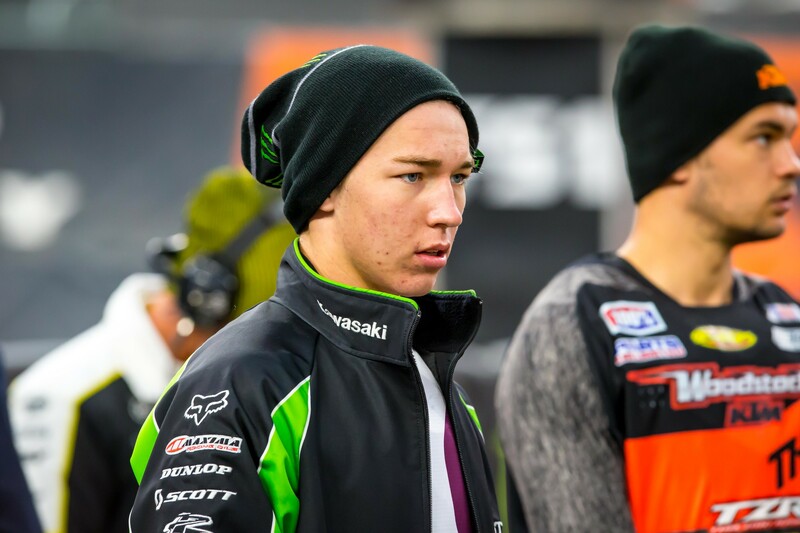 Austin Forkner: Yeah, I don’t know yet. Mitch [Payton] will, basically, tell us the week before now. It’s Saturday, the week before A1, and still don’t know. I have Olly [Stone, mechanic] telling me that nobody has been asking him about plane tickets and stuff for round two at Phoenix. Olly doesn’t really have a race bike ready yet and nobody has said anything to him about it, so he’s like, “I’m pretty sure that you’re East.” I guess I can say that I just don’t know yet. I was able to speak with Adam Cianciarulo a few days ago and he was pretty convinced he’d ride the West. Yeah, I think it’s going to be Adam and [Garrett] Marchbanks in the West and me and [Martin] Davalos in the East. Those two were kind of the first guys to do testing and the first ones doing race bike stuff and getting all of that ready. If I’m East, that’s fine because I’ve got plenty of time. Regardless of who is West, when will the new race bikes be broken in? I would say probably Tuesday. Yeah, I would say Tuesday or Thursday. Press is Friday at Angel Stadium. Out of curiosity, and fans may be interested, what do you guys do when you break in all-new race bikes? I’d assume it’s a cool feeling to do such a thing. From the ’19 bike that I’ve been riding, it’s pretty much had a race motor in it, I’ve ridden with my good suspension, I just haven’t ridden it with everything kinda put together, I guess. They’ll be some extra things to come. Like, we’ll have extra-good transmissions that go in the bikes and you don’t want to put a lot of time on them because they’re expensive to make. It’s stuff like that you don’t ride right away because they’re extra expensive and they don’t make a huge difference. For a practice bike, it’s not going to matter, but for a race bike, you want everything right. The biggest thing for me is getting stuff broke-in—especially the frame. The frame is really rigid when it comes stock and I just need to break that in and get some flex into it, basically. That takes a couple sessions of riding to get that broke in. The new race bike is just always super-stiff because it’s new suspension, new frame, and everything is stiff and rigid. They don’t feel very good when you break them in. I don’t think I could show up at a race on a brand-new bike and just expect to go out there and race it. It would feel so bad during the early practices. To go from a bike with a lot of flex to a brand new one, it’s a big difference. It astonishes me how a world class guy at your level can actually feel flex in a chassis. Yeah, it’s hard to pinpoint exactly where you want the flex to be. I’ve been getting a little bit better just because we’ve been trying some different stuff with frames and making the frames flex differently. I have a little bit better of an idea with that stuff now, but no matter what, it just takes time to break them in. Your teeth would be chattering with an all-new bike at A1? Yeah, I mean I really honestly never want to ride a brand-new bike. Downshifting a gear and taking it back almost a year, what did you make of your 2018 supercross race season? There were highs, lows, ups, downs, and all arounds for you, huh? Supercross was the best. I mean it was super-sick actually getting up there and kind of battling and having the points lead tied at one point. I was happy with everything up to when I separated my shoulder at Minneapolis. I was pretty happy with everything leading up to that. I didn’t really have a reason to be disappointed. [Zach] Osborne was kind of going to be going only guy that was going to be really, really tough for me to beat. It was basically him and me. We were pretty equal in speed. [Jordan] Smith and [Jeremy] Martin were good every now and then, but it was kind of me and him there at every single race. He ended up beating me because I separated my shoulder, but I wish I would not have done that because I would have liked to continue to battle with him throughout the year. I was happy with how supercross went, even though I got hurt. Outdoors was just alright. First couple rounds were real slow coming off of my shoulder injury. I got really rolling probably three races into the championship. Thunder Valley was good and it kind of build, build, build from there. At all those mid-season races, I was the fastest guy at almost every single race. At Southwick, Millville, Washougal, and RedBud, I was one of the fastest guys. I should have been a podium guy at every single one of those races. It was kind of bad luck, although some of it was my fault. The rest of the season was alright and I was just kind of trying to keep it up at that point and not end the season with an injury. With the two regional supercross championships, you guys only race eight or nine times so there really isn’t any sort of margin for error, is there? Yeah, you want to be able to get on a roll and then keep it going. I won Tampa and Atlanta back-to-back and after that I kind of made this decision, like, “Alright, I can’t get beat. I can’t lose after this point.” I think that might be part of the reason I got hurt at Minneapolis. Osborne and Martin were a little bit faster than me that night and I didn’t want to accept getting beat and I was just kind of pushing a little too hard and just messed up in the whoops. Live and learn, I guess. That’s just part of it. A number of 250cc racers will move up to the 450 class for 2019. How will that impact things in your class? Yeah, Osborne, Savatgy, Plessinger, Hill, all of those guys are at least 23, 24, or 25. Osborne is almost 30. Those guys are like adults, basically and they’ve had years of riding in the pros so it’s hard to do that and go straight into battling with them. It was my second year this year and I was happy to be a threat to Osborne. I considered myself to be probably the biggest threat to him before I got hurt. That was cool to be in that position. It was cool to be a threat to him. What’s your game plan for 2019? To be solid this year and to try to make less mistakes. You never really want to settle for a second-place finish or anything, but honestly if you’re at a point where you are going to have to do something a little bit crazy or ride a little bit over your head to catch somebody or something, maybe it is best to settle at times like that. I don’t think you ever really quit learning. I feel pretty good going into this year. My riding is good. I feel like my program and my riding is the best that it has been and people around me are telling me the same thing. They’re saying I look really good and even better than last year, which is good to hear because last year I was pretty good. I’m feeling good. I’d also like to make my first supercross a little better than last year. Last year with all that commotion at Dallas with the first turn pile up and all that stuff, I got seventh. I’d like to start off better so I’m not playing catch up like I was last year. Like, it took me the first four rounds to catch Osborne and then I finally caught him and got the red plate and we were tied. In 2019 I’d like to be the guy that gets ahead early and then everyone else has to play catch up. Still, I don’t want to do anything crazy at the first race and throw it away early. If I could just podium at the first race and just get that done and then just move ahead, that would be good, then I just need to know when to push it and when to settle. That’s the biggest thing I learned from 2018.